A few weeks ago, I happened to be visiting the Lincoln Memorial — again. While I still live in DC, it seems prudent to take advantage of this opportunity that many Americans (and non-Americans!) only get when they’re on vacation. Anyway, while at the Memorial, I happened to stop and listen to a tour guide who was talking about Martin Luther King, Jr.‘s famous speech. Not ironically, he was talking about it because he was standing on (or thereabouts) the same spot where MLK delivered the speech in the 60s. The spot (just in front of) the Lincoln Memorial is the highest one is allowed to give a speech from. Anyway, that’s a bit tangential to the point of this post, so let’s get to it. As the tour guide was speaking, he was explaining how MLK came to be on those steps on that fateful day in August of 1963. The speech was one of nine keynote addresses (Note: I’ve been looking for this statistic somewhere online and haven’t found it, so I could be misremembering exactly what the tour guide said). MLK didn’t sit down to write the speech until the night before the address, as he’d been pretty busy with the events of the March on Washington for Jobs and Freedom. The night before, MLK along with some of his most trusted advisors (Clarence Jones being one of them), sat down to write the draft. When they were finished, MLK went back to his room with the speech. The next day, while giving the speech, Jones noted that MLK had done quite a bit of deviation from the draft they’d written the night before. 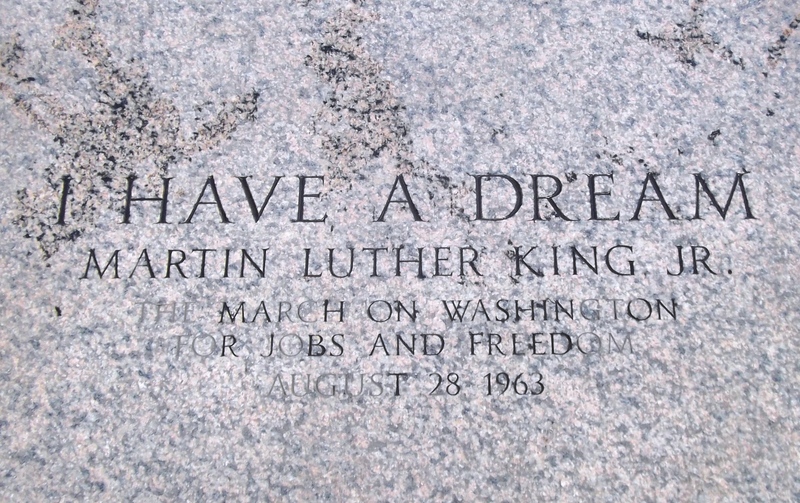 The most remembered part of the speech, “I Have A Dream…” was not part of the original draft. Surprised? I certainly was when I heard the guide say this. Would you also be surprised to know that MLK first gave the speech when he was a teenager? He first delivered the speech in church when he was a teenager. It had been something that he’d worked on and given before, but as I said, it wasn’t part of the original text he was to deliver on August 28, 1963. So, then, how did he come to say those famous words? Incredible, eh? Can you imagine how different the USA world would be if MLK hadn’t given that speech that day? Can you imagine how different it’d be if Mahalia hadn’t shouted to MLK to tell ’em about the dream? And if you’re interested, the text of the speech. This entry was posted in History, Politics and tagged Abraham Lincoln, Behind the Dream, Civil Rights, Civil Rights Movement, Clarence Jones, Equality, I Have a Dream, I Have a Dream Speech, Lincoln Memorial, Lincoln Memorial Steps, Mahalia Jackson, March on Washington for Jobs and Freedom, Martin Luther King, MLK, MLK Speech, PBS, Perspective, Tavis Smiley. Bookmark the permalink. How very interesting – destiny eh?